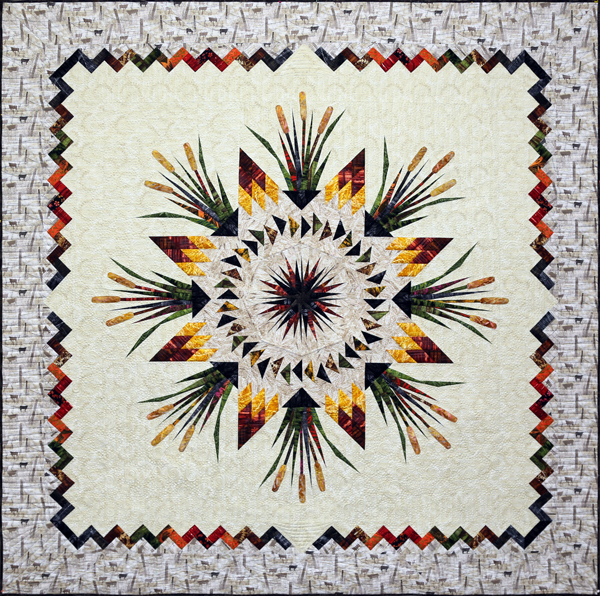 Cattail in the Meadow: A Special Reclaimed West Release was designed by Brad and Judy Niemeyer for foundation paper piecing. 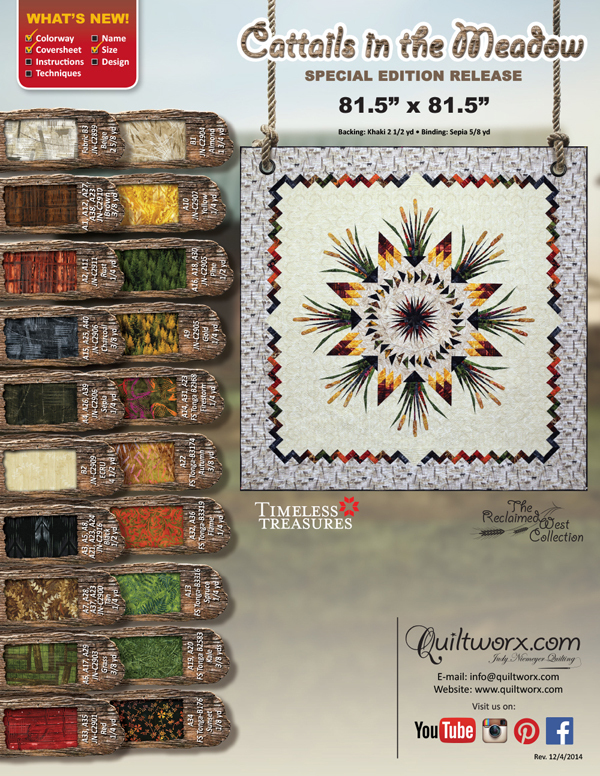 The pattern was part of the inspiration for the Reclaimed West Fabric line designed by Judy and Judel Niemeyer with Timeless Treasures and was made out of the collection in an expanded size to the original pattern, which is still on the Market and will continue to be on the market even after this pattern has sold out. With only 2,500 copies available, this design won’t be around forever! 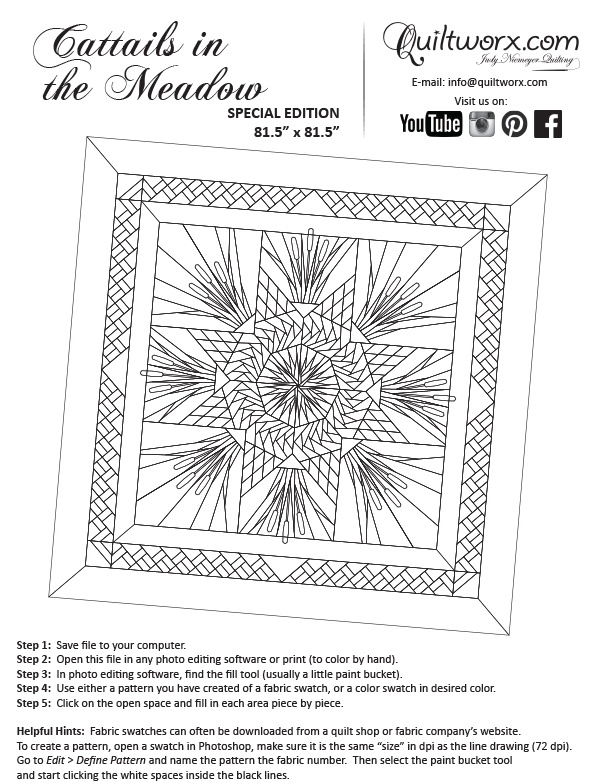 It increases the size of the pattern from 70” x 70” to 81-1/2” x 81-1/2”. The quilt on the coversheet was pieced by Certified Instructor, Jan Mathews and quilted by Brandy Rayburn from The Quilting Place…Where Quilts Happen. Thank you to these two very talented ladies for making this quilt sample for us! A similar sample was also completed in Australia, by Certified Shop Just One More Stitch Owner, and recently Certified Instructor, Leonie de Haas. Leonie’s sample is not shown on the cover, but yardage information and a sample photo are available on our website. 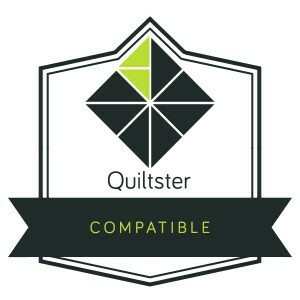 This version of the pattern uses updated applique techniques featuring the Stick N Peel stabilizer, and also includes a helpful table if you want to make this quilt out of your own colorway. Pat McCleary Aren't they fun!!!!!!! Gerry Casper Amazing! I have the pattern, but have yet to make it! Carlena Borowka love this quilt. where can I get a pattern? Lise Foley Just beautiful. ! Kellie Miranda Keesee Stunning work. Gerry Casper I have this pattern, but haven't made it,yet. I love seeing the colors others are using. Susan Kappelman Almost missed the cat and the tail! Pretty. Judith Burke That's one way to hide a cat... Lovely quilt, by the way! Debbie Wilson Judy Jensen I think I need to made this? Pam Deal "Kitty Kat" approved! Beautiful work! Jennifer Mellow I LOVE the border! And the cat! Marie Carlson Haag Beautiful. Love the colors. Eileen Norbury Marquardt My fav !!! Marika J. Senkár Ez is csúcs szuper!! !